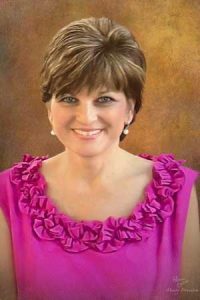 LINCOLTON, Ga. – Laura Hammond Reed, 52, loving wife of William Herbert Reed, Jr, (Billy) entered into rest Thursday, September 4, 2014 at her residence after losing her courageous battle with cancer. Laura was born on October 3, 1961 and was one of three daughters of Mildred and TC Hammond. She grew up in Edgefield, SC and graduated from Wardlaw Academy. She married Billy and moved to Lincolnton, GA on September 6, 1986. Laura was the beloved mother of Austin and Crafton Reed. She was an avid supporter of the Lincoln County Baseball team all the years her sons played ball. Laura was dedicated to her job of 24 years at Farmers State Bank. She was an officer of the bank and over the years she served in numerous positions, most recently as the Human Resource Coordinator. She was known for greeting customers with her beautiful smile that could light up any room. Laura was a member of Pine Grove United Methodist Church and actively involved in the UMW and also served as the church treasurer. In addition to her husband and parents, survivors include two sons Austin Reed and his wife Tracy and Crafton Reed. Two Sisters, Jane Griffin and husband Ted of Evans, GA and Maribeth Kreps and husband Chip of Savannah, GA. Laura was the loving aunt of several nieces and nephews and the cherished aunt of Stephanie Reed Partridge. Visitation for family and friends will be Friday, September 5, 2014 from 6 to 8 pm at Beggs Funeral Home. A memorial service will be held Sunday, September 7, 2014 at 3:00 at Pine Grove United Methodist Church. Interment will follow in the church cemetery. Donations can be made to TJ & Friends Foundation at 706-283-1394. Please visit the website at www.beggsfuneralhome.net and sign the guestbook.